Can you image floating in a pool with little outside stimuli? Just relaxing effortlessly and not knowing where your body ends and the water begins? 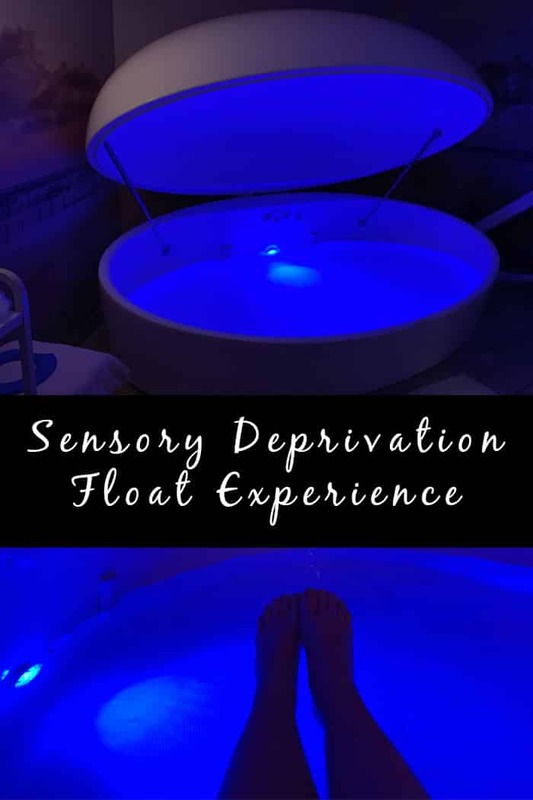 This is what I experienced when I tried a Float Experience in a sensory deprivation tank when we were at Spa Kalahari. Last month, my family visited Kalahari Resorts in Lake Erie Shores & Islands for a weekend getaway. The first morning we were there I had the opportunity to do a float experience. This is a fairly new therapy and I’d never tried it before so I was excited. I arrived at the spa 15 minutes early. I knew this would be water-related so I wore my bathing suit. This is not required though, as the float tank is in an entirely private room. Once you enter the room with the tank you will do a rinse-off shower (with your suit on is fine). If you have any cuts or scrapes you will want to cover them with the provided petroleum jelly to protect them from the salt solution. You will also want to use the provided ear plugs to keep water from getting in your ears. Before getting to the spa I was a little apprehensive about the float, fearing that the tank would make me claustrophobic. This turned out not to be a problem. You have the option of keeping the lid open or closed, the lights on or off, and the music on or off. The purpose of the tank lid is to reduce as much external stimuli as possible. The water in the tank is actually only between six and ten inches deep. It is made up of a very dense salt solution which will allow you to float effortlessly. Literally all you have to do is lay back and float. For me, I decided to keep the tank lid closed but the lights on (they are dim blue lights). It was hard at first to fight my natural instinct to try and make myself float. Once I was able to relax completely I was amazed at how effortlessly I floated. The water is warmed to body temperature so when you get into a state of deep relaxation it is difficult to sense where you body ends and the water begins. It was truly a relaxing experience but I did have trouble turning my mind off completely and allow my body to just go with the experience. 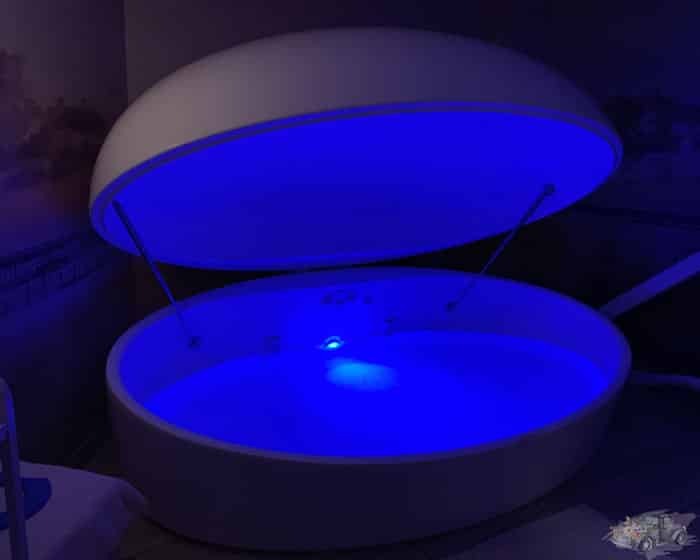 The entire float takes about an hour and you should leave the tank feeling relaxed and rejuvenated. I will warn you that once you get out of the tank it will be cold! After you exit the tank, you’ll immediately get into a shower to rinse off the salt solution. Be very careful not to let the solution drip into your eyes — it will burn! Completely wash your body and hair to get the solution off. This was a very unique experience and I think that if you do these floats frequently it could be very beneficial for stress management. 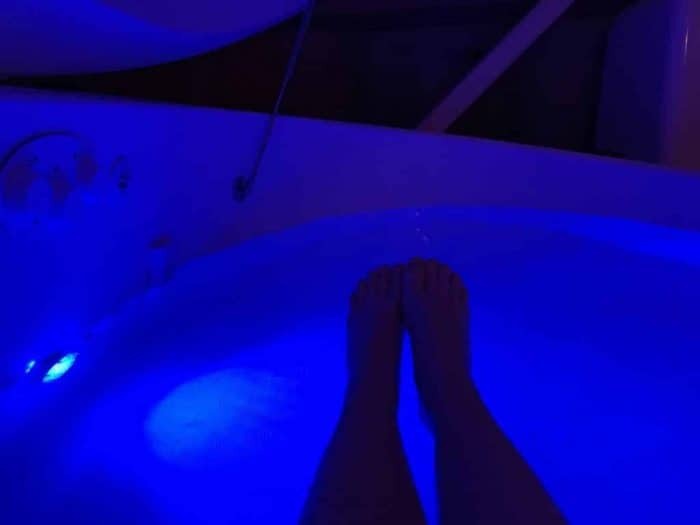 Being able to do a sensory deprivation float experience right at the resort was fun, but these experiences are also available at other spas. I know I am going to be checking out where to find one once we get back to Pittsburgh! Be sure to read more about our trip to Kalahari Resorts and Lake Erie Shores & Islands!